Mount St. Helens has erupted more frequently than any other volcano in the Cascade Range during the past 4,000 years. The volcano has exhibited a variety of eruption styles—explosive eruptions of pumice and ash, slow but continuous extrusions of viscous lava, and eruptions of fluid lava. Evidence of the volcano’s older eruptions is recorded in the rocks that build and the deposits that flank the mountain. Eruptions at Mount St. Helens over the past three decades serve as reminders of the powerful geologic forces that are reshaping the landscape of the Pacific Northwest. On May 18, 1980, a massive landslide and catastrophic explosive eruption tore away 2.7 cubic kilometers of the mountain and opened a gaping, north-facing crater. Lahars flowed more than 120 kilometers downstream, destroying bridges, roads, and buildings. Ash from the eruption fell as far away as western South Dakota. Reconstruction of the volcano began almost immediately. Between 1980 and 1986, 80 million cubic meters of viscous lava extruded episodically onto the crater floor, sometimes accompanied by minor explosions and small lahars. A lava dome grew to a height of 267 meters, taller than the highest buildings in the nearby city of Portland, Oregon. Crater Glacier formed in the deeply shaded niche between the 1980-86 lava dome and the south crater wall. Its tongues of ice flowed around the east and west sides of the dome. Between 1989 and 1991, multiple explosions of steam and ash rocked the volcano, possibly a result of infiltrating rainfall being heated in the still-hot interior of the dome and underlying crater floor. 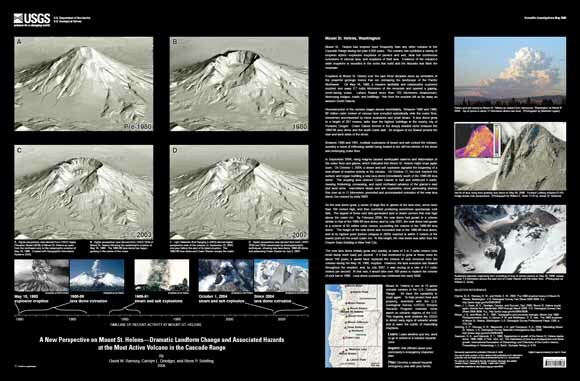 In September 2004, rising magma caused earthquake swarms and deformation of the crater floor and glacier, which indicated that Mount St. Helens might erupt again soon. On October 1, 2004, a steam and ash explosion signaled the beginning of a new phase of eruptive activity at the volcano. On October 11, hot rock reached the surface and began building a new lava dome immediately south of the 1980-86 lava dome. The erupting lava cleaved Crater Glacier in half and bulldozed it aside, causing thickening, crevassing, and rapid northward advance of the glacier’s east and west arms. Intermittent steam and ash explosions, some generating plumes that rose up to 11 kilometers, preceded and accompanied extrusion of the new lava dome, but ceased by early 2005. As the new dome grew, a series of large fins or spines of hot lava rose, some more than 100 meters high, and then crumbled producing sometimes spectacular rock falls. The largest of these rock falls generated dust or steam plumes that rose high above the crater rim. By February 2006, the new dome had grown to a volume similar to that of the 1980-86 lava dome; and by July 2007, the new dome had grown to a volume of 93 million cubic meters, exceeding the volume of the 1980-86 lava dome. The height of the new dome also exceeded that of the 1980-86 lava dome, and at its highest point (before collapse in 2005) reached to within 2 meters of the lowest point on the south crater rim. At this height, the new dome was taller than the Empire State Building in New York City. The new lava dome initially grew very quickly, at rates of 2 to 3 cubic meters (one small dump truck load) per second. If it had continued to grow at these rates for about 100 years, it would have replaced the volume of rock removed from the volcano during the May 18, 1980, eruption. However, the lava extrusion rate slowed throughout the eruption, and, by July 2007, it was oozing at a rate of 0.1 cubic meters per second. At that rate, it would take over 700 years to replace the volume of rock lost in 1980. Lava dome extrusion has continued into early 2008. For questions about this report, contact Dave Ramsey.